“What should have been one of the happiest days of my life ended up being one of the loneliest. Eight days before my graduation from seminary, my wife decided she didn’t want to be married any more. I felt hopeless. When I met my parents on the day before graduation, my mother gave me a card which contained the scripture quoted above. “Jeremiah wrote this scripture to the Israelites who were exiled in Babylon to give them hope that God had not forgotten them. In my own exile, my time of loneliness and despair, the verse reminded me that I am God’s child. God still loved me and had not forgotten me. “. . . Even in the hardest moments, God was faithful. It took two years, but I eventually found work in a church and even remarried. THOUGHT FOR THE DAY – God loves me and wants good things for me. Prayer: Holy God, thank you for loving us and wanting the best for us. 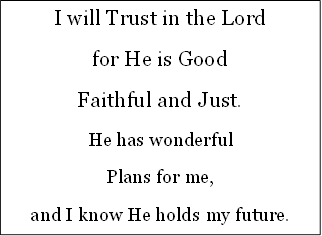 Help us to trust you even when life looks bleak. Amen. This entry was posted in Comfort, Encouragement, Guidance, Hope, Inspiration, Love, Peace and tagged Actions, Answers, Ask, Battles, Believe, Bible, Choices, Conflicts, Control, Death of a child, Desires, Distress, Doubt, Dreams, Evil, Expectations, Faith, Follow, Future, Goals, Hiding, Holy Spirit, Intentions, Judging, Laws, Love, Marriage, Motives, Obedience, Oppressed, Problems, Promises, Provide, Reason, Respond, Scriptures, Success, Suffering, Unify, Wisdom, Worry. Bookmark the permalink.